As usual, I tend to read every post that goes through my FB wall. I discovered that this wooden tea pot is very unique and cute. I must admit that that this is my very first time seeing a tea pot in wooden from. Is it practical? How difficult is it to clean the inside which I believe will be difficult? More negative thoughts will come if you keep pondering with it? As such, I would appreciate if someone can tell me more of its usage. Moreover, the beautiful tea pot is good to add to my collection of tea posts. It also give us a new perspective to look at thing. Who know it might offer us great opportunities especially in today's world of fast changing and vibrant. Coming back to this tea pot, the maker must have given detail thoughts. Look the lip, can be easily lifted up with reasonable big Oval-shape handle. There are two Oval-shape handles at the lower side of the tea pot. I strongly believe it represents something significant and hope someone can enlighten us in this aspect. 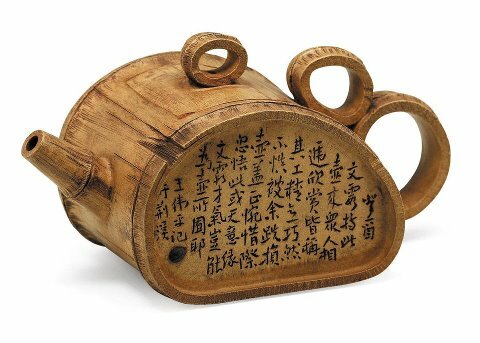 Another beauty of this tea pot is of its meaningful poems embedded at its surface. With this, it will definitely turn the environment even more peaceful as reflected in this poem. No wonder, it is always the scholar's collection and good companion. By doing so, it will drive its collectors to be more lively and encourage creation of more of such wonderful art works. Trust you too like this art piece. Kindly share it out if you wish to turn this world to be more wonderful, peaceful and cheerful, which we believe you have such a wish. Thanks and look forward to hearing your feedback through the comment column provided below.